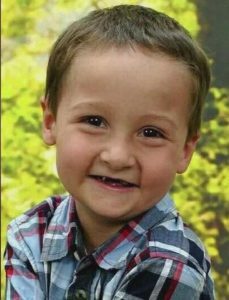 In a few short weeks, it will have been two months since five-year-old Lucas Hernandez was last seen in his Wichita home. The search following his disappearance has been frustrating and fruitless, as investigators involved with the case remain stymied, leaving friends, family, and even strangers on the internet to provide their own armchair detective theories about what happened to the missing boy. Lucas was last seen on February 17th, 2018 in his bedroom in the home of his father, Johnathan Hernandez. On the day Lucas disappeared, Hernandez left him in the care of his stepmother, Emily Glass, 26. According to police reports, Glass checked on Lucas at 3:00 PM in his room. She then took a shower and fell asleep. When she awoke to find Lucas missing, she called Wichita police to report his disappearance. at approximately 6:15 PM. The investigation into Lucas’s disappearance led investigators to uncover an unrelated child-endangerment complaint filed against Glass the day before the five-year-old went missing. The complaint concerns Lucas and his one-year-old sister, claiming Glass “unlawfully, knowingly and unreasonably caused or permitted a one-year-old child to be placed in a station in which the child’s life, body or health may be endangered.” The charge regarding Lucas’s safety was eventually dropped. 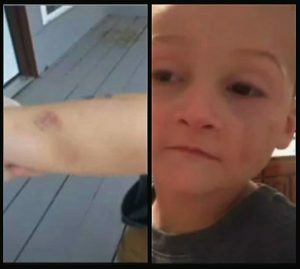 Friends, neighbors, and even family close to the investigation have told both law enforcement and media outlets of their suspicions that Lucas and his sister were being abused, having cited photographs of bruises on Lucas’s body, and statements by Lucas to family that Glass had beaten him and dragged him across the floor. Despite pleas with an arraignment judge to lower her $50,000 bond, Glass still remains in jail. Jamie Orr, the boy’s biological mother, was involved in the original grid search for her son that spanned several local parks, desperate for confidential tips that might lead to her son’s safe return. However, her interactions in her personal relationships and social media have led both family and strangers alike to believe that she might know more about her son’s disappearance. Her ex-boyfriend, Robert Cook, has alleged in screenshots from text messages and posts on social media that Orr had a plan to kidnap her son and elope with Hernandez. This theory was further compounded by Orr’s efforts on the famous crowd-funding platform, GoFundMe, to raise a staggering $600 million in comparison to the original goal of $5000. 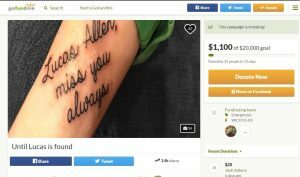 Her motives are under scrutiny, especially since she used a portion of those funds to pay for a tattoo on her right forearm that reads, “Lucas Allen, miss you always,” the phrasing of which has only deepened suspicions surrounding Orr’s culpability. Although her actions during this time have come across as morbid and suspicious, investigators have yet to link her to Lucas’s disappearance. Lucas was born Dec. 3, 2012, has brown hair and brown eyes, is about 4 feet tall and weighs about 60 pounds. He was last seen wearing black sweats, white socks and a gray shirt with a bear on it. As the original tip line has been closed, investigators ask that anyone with information that might lead to Lucas’s safe return to call detectives at 316-268-4407 or Crime Stoppers at 316-267-2111.